The numerous cutters and craft of the U.S. Coast Guard —from the sail training ship Eagle to the large oceangoing patrol ships; from polar icebrakers to small utility boats — form a formidable fleet to meet the many challenging assignments undertaken by the service. 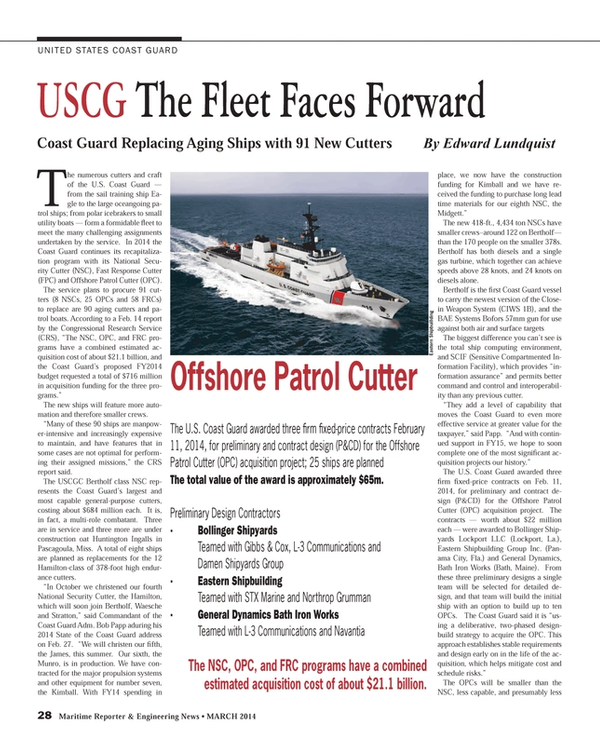 In 2014 the Coast Guard continues its recapitalization program with its National Security Cutter (NSC), Fast Response Cutter (FPC) and Offshore Patrol Cutter (OPC). The new ships will feature more automation and therefore smaller crews. “Many of these 90 ships are manpower-intensive and increasingly expensive to maintain, and have features that in some cases are not optimal for performing their assigned missions,” the CRS report said. The USCGC Bertholf class NSC represents the Coast Guard’s largest and most capable general-purpose cutters, costing about $684 million each. It is, in fact, a multi-role combatant. Three are in service and three more are under construction oat Huntington Ingalls in Pascagoula, Miss. A total of eight ships are planned as replacements for the 12 Hamilton-class of 378-foot high endurance cutters. The new 418-ft., 4,434 ton NSCs have smaller crews–around 122 on Bertholf—than the 170 people on the smaller 378s. Bertholf has both diesels and a single gas turbine, which together can achieve speeds above 28 knots, and 24 knots on diesels alone. The biggest difference you can’t see is the total ship computing environment, and SCIF (Sensitive Compartmented Information Facility), which provides “information assurance” and permits better command and control and interoperability than any previous cutter. The OPCs will be smaller than the NSC, less capable, and presumably less expensive. The Coast Guard plans to build 25 of them to replace the 14 ships of the 210-foot Reliance-class medium endurance cutters and 13 270-foot “Famous class.” The 1,400 ton 210s entered service 1964 and 1969, while the 1,800-ton 270s are newer, commissioned between 1983 and 1990. There is also the USCGC Alex Haley (WMEC 39), a converted U.S. Navy ocean going salvage ship. At 283 ft. and 3,400 tons, Alex Haley she is based in Alaska where she conducts fisheries patrols and search as rescue duties, but she is more than 30 years old. The new OPCs will have greater range and longer endurance than the ships they will replace; will be more powerfully armed; and will accommodate the latest Coast Guard aircraft and small boats for all-weather operations. What’s more, the OPC’s systems will be fully interoperable with the National Security Cutters and other military ships and aircraft and bases ashore. The Sentinel-class Fast Response Cutter (FRC) is the newest Coast Guard patrol boat, capable of conducting independent port, waterways and coastal security; fishery patrols; search and rescue; and national defense missions. The FRC is based upon the Stan Patrol 4708 patrol boat design from Damen Shipbuilding in the Netherlands, and similar to vessels being acquired by the Canadian coast guard. The service plans to acquire 58 FRCs to replace the 41 boats that comprise the service’s 110-ft. Island-class of patrol boat, and will compliment 73 vessels of the 87-ft. Marine Protector class. While the Coast Guard has four “red hull” icebreaking ships, one is designed for Great lakes duty, and another is actually a research ship. The Great Lakes icebreaker, USCGC Mackinaw (WLBB 30), is used for servicing aids to navigation on a seasonal basis. She can conduct SAR and law enforcement operations, and respond to oil spills, as well as breaking ice in the winter months. The 3,500-ton, 240-ft. Mackinaw is based at Cheboygan, Michigan, and can break ice up to three feet deep. The 17,000-ton Healy is an ice capable research ship and a medium duty icebreaker able to break ice 4.5 ft. thick at three knots. The two 13,000-ton Polar class ice breakers are the most powerful in the world, but the Coast guard has only been able to keep one operational in recent year. USCGC Polar Star (WAGB-10) was placed in a caretaker status in 2006, but has now been overhauled, refitted with a new propulsion plant, and supported Operation Deep Freeze in the Antarctic during the 2013-2014 season. USCGC Polar Sea (WAGB-11) was active until 2010, and scheduled to be decommissioned after the return of Polar Star to service. A new icebreaker construction program is needed. The Coast Guard is in the preliminary phase of a new, heavy polar icebreaker acquisition project. But until a replacement is available the Coast Guard may opt to overhaul Polar Sea and keep her in service. The “black hull” workhorses are the unglamorous buoy tenders and other auxiliaries that tend aids to navigation, conduct law enforcement, pollution control, and search and rescue missions. The Coast Guard has 16 multi-mission 225-foot Juniper-class seagoing buoy tenders (WAGLs). The lead ship, USCGC Juniper (WLB 201) entered service in 1996. The 225s displace about 2,000 tons and can remain at sea for up to 45 days. The 6,000 mile range at 12 knots is important as the U.S. is responsible for reaching distant U.S. territorial waters, such as those surrounding remote islands in the Pacific. Buoy tenders have powerful handling equipment to retrieve buoys, repair them on deck, and put them back in the water. They have powerful handling equipment to retrieve buoys, repair them on deck, and return them to service after maintenance. They are capable of light icebreaking. The newest, USCGC Alder (WLB 216) was commissioned in 2005. Other black hull include inland buoy tenders, inland construction tenders, ice breaking tugs and other auxiliary craft. These include 175-foot Keeper-class coastal buoy tenders and 140-foot Katmai-class icebreaking tugs. One other distinctive Coast Guard cutter of note is the cadet training ship Eagle. The Coast Guard is also updating its many small boats, which it operates in large numbers, with more tha 400 Defender-class Response Boat Small (RB-S) craft alone. A replacement, the RB-S II, will feature an emphasis on function and crew comfort, and will gradually replace the Defender-class RB-S as they reach the end of their service life.